During January 2012, an archaeological excavation was conducted in the national park of the ancient synagogue at ‘En Gedi (License no. G-1/2012; map ref. 23708/59690). The excavation, undertaken on behalf of the Institute of Archaeology of the Hebrew University of Jerusalem and underwritten by contributions of foundations and individuals from abroad and the Dead Sea and ‘Arava Science Center, was directed by G. Hadas, with the assistance of R. Merhav (administration), D. Porotzki (surveying and drafting) and A. de-Vincenz (ceramics). Additional assistance was provided by the Nature and Parks Authority. Volunteers from Israel and overseas participated in the excavation, mostly veterans of the ‘En Gedi Oasis expedition, as well as volunteers from the ‘En Gedi Field School, ‘En Gedi Nature Reserve and students of the Melah Ha-Arez preparatory program at ‘En Gedi. The purpose of the excavation was to continue exposing Halfi House, which is situated very close to the northern side of the synagogue. The house was partially excavated in the 1970s (Barag and Porat 1970; Barag, Porat and Netzer 1972) and was cleaned in the 1990s (Hadas 2005:44*–47*, Plan I, Figs. 5–9). The excavated area of Halfi House was expanded northward (Figs. 1, 2); however, the building’s northern wall has yet to be uncovered. 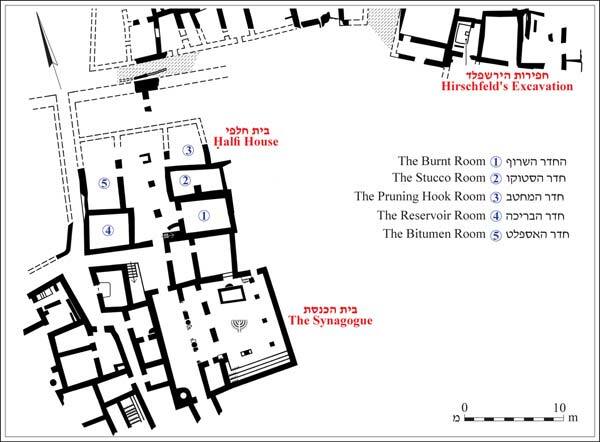 A large courtyard is in the center of the building, flanked to the east by the “Burnt Room” (1), the “Stucco Room” (2) and the “Pruning-Hook Room” (3), and to the west by the "Reservoir Room" (4) and the "Asphalt Room" (5). Collapsed, sun-dried mud bricks that had been used to build the upper story and part of the walls of the ground floor were found. The roofs were built of palm tree trunks placed widthwise across the rooms and rushes covered with a thick layer of mud were laid perpendicular on top of the trunks. The walls and floors of the rooms were plastered with layers of fine mud mortar, sometimes with an addition of white lime grains. Several basalt grinding stones and fragments of donkey millstones were found in secondary use as building stones in the courtyard. The southern part of the courtyard had been excavated in the 1970s, at which time a square pillar was found in its center. In the 1990s, while preparing the site for public visits, what was left of the balks that remained at the site since the 1970s was removed, Room 1 was completely exposed, another square pillar was uncovered in the courtyard and a cooking corner was exposed near the steps to the right of the entrance to the courtyard. It seems that the steps led to the second story by way of a balcony that was borne atop the pillars. Burnt palm-tree trunks that supported the ceiling were found on the floor of Room 2. A fragment of a round marble slab was found and also a large piece of stucco plaster decorated with an egg and dart motif, both of which most likely originated in another building. It became apparent during the excavation that the two upper courses of the room’s southern wall’s four courses were built as part of the conservation/reconstruction measures that were implemented at the site in 1995. The location of the entrance to the room, which was in the western wall facing the courtyard, was blocked when the concrete anchor for the tent was poured in the 1990s. It was ascertained in two probes excavated in the middle of the room that beneath the floor (depth 0.3 m) was an earlier habitation layer that included a floor abutting another wall, where a few Roman potsherds were found. Room 3 is the northernmost room whose northern wall has still not been exposed. Here too, burnt palm-tree trunks were found above the floor, which was composed of thick beige mud mortar applied to a pebble base. A shattered jar was found on the floor in the eastern side of the room; an iron pruning-hook and a whole sandal lamp were discovered above the floor in the middle of the room. Room 4, which is the southwestern room, is square and was mostly excavated in the 1970s. A thin layer of soil was removed and the southern face of the northern wall was exposed. It was coated with gray calciferous hydraulic plaster used in pools. Remains of wall plaster embedded with fragments of Roman jars and extending from the wall down to the ground were discovered in the northeastern corner of the room. This is therefore the northern wall of a reservoir from the Roman period that is adjoined by the western and eastern wall of the Byzantine period. No opening was visible in this room either; however, two vertical construction lines of the doorway’s jambs were noted on the interior of the eastern wall. It seems that here too the opening was blocked during the restoration work of the 1990s. Room 5 is a large longitudinal room with an opening to the courtyard, whose northern wall has not yet been exposed. Several very smooth tesserae and a lump of coins were found in the excavated probe. Bits of bitumen were found in all of the building’s rooms; however, many pieces and lumps of bitumen were found in this room, one of which weighed c. 3 kg. 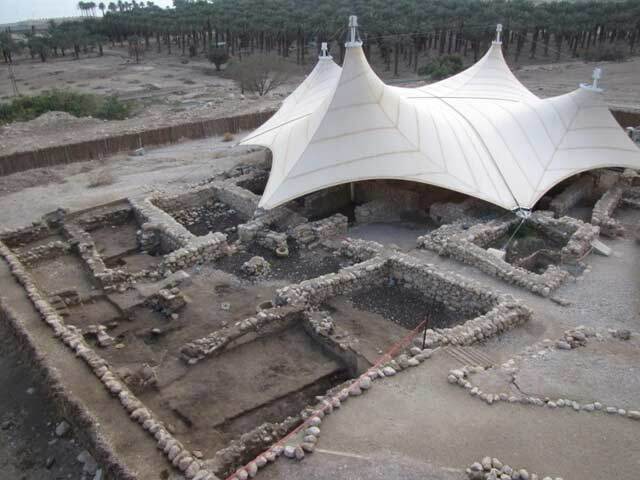 It turns out that Halfi House is the largest building found to date in the Byzantine village of ‘En Gedi and its area already exceeds that of the synagogue. Here, as in all the other parts of the village (Hirschfeld 2007), there is evidence of a settlement in the Roman, Byzantine and Mamluk periods. The artifacts recovered included pottery, glass fragments, bones and many pieces of charred wood, bitumen and several coins in each room. Like the rest of the village’s houses, Halfi House was destroyed in a mighty conflagration in the mid-sixth century CE (Hadas 2005:69). The aim of the next season will be to complete the excavation of Halfi House, the large house adjacent to it and the alleys bordering it to the west and north. Barag D. and Porat Y. 1970. The Synagogue at En-Gedi. Qadmoniot 11:97–100 (Hebrew). Barag D., Porat Y. and Netzer E. 1972. The Second Season of Excavations at the Synagogue of En-Gedi. Qadmoniot 18:52–54 (Hebrew). Hadas G. 2005. The Excavation in En-Gedi Village 1993–1995. ‘Atiqot 49:41*– 71* (Hebrew). Hirschfeld Y. 2007. En Gedi Excavations II: Final Report 1996–2002. Jerusalem. 2. The excavation, looking southeast.